Del Webb at Lakewood Ranch (just northwest of Sarasota) is one of the newest communities geared towards the active adult buyer aged 55+. This luxury adult only community, located just off of State Road 70, east of I75, is situated on 640 acres with plans to construct 1200 homes. The first phase is now open and will include a total of 400 homes. 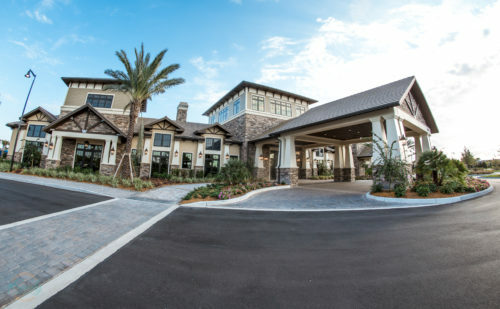 Del Webb is a national brand of Pulte Group Homes and has a reputation for being a leader in building thriving, active adult communities throughout the United States. Prices for Del Webb at Lakewood Ranch begin in the mid $200,000s to mid $500,000s. There are 10 home designs to choose from with square footage starting at 1,289 SF to 2634 SF. There is a friendly, experienced full-time on site Lifestyle Director, who organizes social events, day trips, movie nights and wine tasting. How about a game of pickelball or bocce ball? Maybe kayaking around Robinson Preserve and enjoying our beautiful Florida winter weather is what you are looking for. You may want to do all three. That is the one of the best reasons to live in Del Webb at Lakewood Ranch. There are daily activites and numerous clubs to belong to and meet your neighbors. Residents here not only enjoy physical activites but there are groups such as pottery and mahjong that meet weekly or monthly. So, you can be a busy as you want to be. This community is golf cart friendly, so it is easy to get around. Plus, during the holiday season, you can join the golf cart holiday parade. 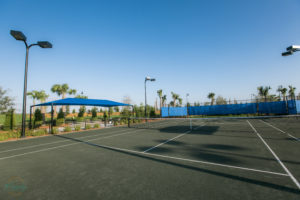 As a resident of Del Webb at Lakewood Ranch, you will not only have amenities and activities within your neighborhood but you will also enjoy the master-planned community of Lakewood Ranch. Award winning, Lakewood Ranch offers residents specialty shops, fine dining and a movie theater. On any weekend evening, just strolling down Lakewood Ranch, you will hear live music, people out enjoying the beautiful Florida evening with an outdoor dinner, or on their way to catch a movie. There is alway something going on in Lakewood Ranch. Not only is Del Webb conveniently located to shopping and dining but is also in proximity to a large hospital and other medical professional facilities. 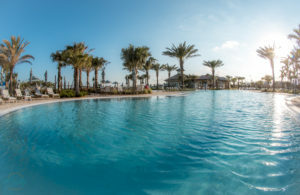 Whether you are planning on making Del Webb at Lakewood Ranch your new home or home away from home, you will find plenty of things to do in the area while enjoying the Florida lifestyle with the beaches, shopping and entertainment. Living at Del Webb is like living at a luxury resort. The pool and patio area welcomes you with the fountains, shaded areas and a water view. Want something cool to drink while you lounge in the hot tub? Adjacent to the pool is a full-service restaurant that offers lunch and happy hour. Meet your friends and enjoy watching the birds grab their dinner too. Del Webb’s community center is beautifully decorated and has plenty of room to host neighborhood events such as comedy hour or guest speakers. Pop up get-togethers are fun and residents bring a dish, a drink and socialize. Clubhouse with Kitchen Facilities, Activity and Craft Rooms. If you like golfing, Lakewood Ranch is home to several public as well as private courses. The back entrance to Del Webb allows access to golf courses and a country club. The ease of just grabbing your clubs and hopping in your golf cart to play a short round is just another reason people choose to live here. There is also a polo club, a gun club and other organized groups to join depending on your interests in Lakewood Ranch. The HOA fees at Del Webb include the following items, community amenities, lifestyle director, landscape maintenance of the common grounds as well as each home, irrigation of the common areas, a staffed and gated entrance, professional property management. The fees are based on which series of home you own. Below is the HOA fees for Del Webb in Lakewood Ranch. These HOA dues are paid quarterly. When you purchase a home in Del Webb, there are two additional fees paid at closing (if you are buying directly from the builder). The first fee is called the Initial Capital Contribution fee, which is currently $500. The second fee is called the Amenity Fee which supports the clubhouse, pool and other equipment. The amenity fee is $2,500. Both fees are collected at the time of closing. If you are purchasing a resale in Del Webb, there is only 1 additional fee. That fee is known as the Resale Capital Assessment and it is currently set at $1,000. That fee will be collected at closing. It is possible that an annual food and beverage fee will be collected in the near future. Living close to Interstate 75 affords the opportunity for access to major airports within the community. The following are driving times from Lakewood Ranch to the various airports. Uber and Lyft service the area of Del Webb and allows for an easy commute when someone else drives! The Sarasota airport (SRQ) is adding daily flights during the winter season to places like Long Island and other locations along the eastern seaboard. You can check online for flights and other information below. Art and culture are vital to a community. You will find that the Sarasota and Lakewood Ranch area offers a varitey of art museums, theatres and music venues. Spend an afternoon at the Ringling estate, walk through the beautiful bayfront gardens and enjoy afternoon tea at the Museum Cafe. The Village of the Arts in Bradenton has a monthly artwalk that allows visitors to mingle with the local artists who work and live in the community. This event takes place on the first Friday evening and Saturday afternoon of every month. In the village, you will find speciality shops, healing arts and live music. The Village also has great restaurants that are chef owned. If you enjoy live music, checkout the Bradenton Blues Festival in early December. This Blues Festival has grown into a nationally recognized event that draws music lovers from all over the world. Below are just a sample of museums and theatres around the Del Webb area. Del Webb is located in the town of Lakewood Ranch, just off Interstate 75. Within the town of Lakewood Ranch is the Lakewood Ranch Medical Center that is not only a 120 bed hospital with emergency services, but is also staffed with over 400 physicians. In addition, the medical center offers outpatient services including women’s and a children’s center. In Sarasota and Bradenton area, you will find major hosptials as wells as rehabilitation facilities. The Mall at University Town Center: This mall is home to stores such as Macy’s, Tommy Bahama, Saks Fifth Avenue and more. Dine at Capital Grille or the Cheesecake Factory. The mall is a short ride from Del Webb. Shoppes at University Town Center: The shoppes are home to retailers like Pier One, Marshalls, Home Goods, Total Wine and Nordstrom’s Rack. You will also find great restaurants like Bonefish Grill, and Lee Roy Selmon’s (BBQ). Downtown Lakewood Ranch: Downtown Lakewood Ranch is just a mile from Del Webb. 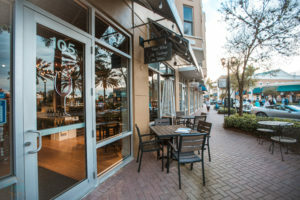 In downtown Lakewood Ranch, you will find a cinema, several restaurants with outdoor dining and a bicycle store too. Downtown Lakewood Ranch also hosts many community events throughout the year, such as Music on Main, nature walks and even 5K runs. Sandy Williams is an Associate Broker with eXp Realty and a resident of Del Webb. Sandy is originally from Indiana but has been a Florida resident for over 12 years. Sandy and her team are real estate experts in the areas of Lakewood Ranch, Bradenton, Sarasota and Anna Maria Island. In the past year, Sandy has helped over 15 homebuyers build in Del Webb at Lakewood Ranch. See the New Video of Del Webb at Lakewood Ranch. Get the list of amentities, home prices and look inside the model home the Martin Ray.